Whenever I am asked about my favorite American Made products, Homer Laughlin China‘s iconic Fiesta dishware is always at the top of my list. That's why I'm thrilled to be helping one of our readers start (or add to) their FiestaWare collection. Someone is going to win two 3 pc Bistro Place Settings, so spread the word to all of the Fiesta fans out there! What Color is Your FiestaWare Collection? Right this moment, I'm drinking a latte topped with Michigan's Maple Moon sprinkles out of a cobalt blue Fiesta coffee mug. I wish I'd taken a picture before I snarfed down the sugar-topped foam because it was a beautiful sight to see. Believe me. I treasure my dark, dark blue Fiesta pieces and I have a pretty yellow Fiesta pitcher that I enjoy all year long. Fiesta is America's most collected line of china, but it is not the kind of fragile china we need to hide on a high shelf. Made by the Homer Laughlin China Company in West Virginia, Fiesta pieces have been used daily since it was introduced in the mid-1930's. It has an unbelievable 5-year chip replacement warranty, is microwave and dishwasher safe, oven proof, and lead free. The pitcher's familiar art deco style is held in high regard in many museums including the Smithsonian, but the Fiesta line also includes a complete array of over 75 everyday dinnerware, serving pieces, and bakeware. What makes it particularly fun to collect is the huge range of colors. A new color is introduced every year and over 35 different colors have been produced over the decades. This year's new color is Daffodil, shown below. 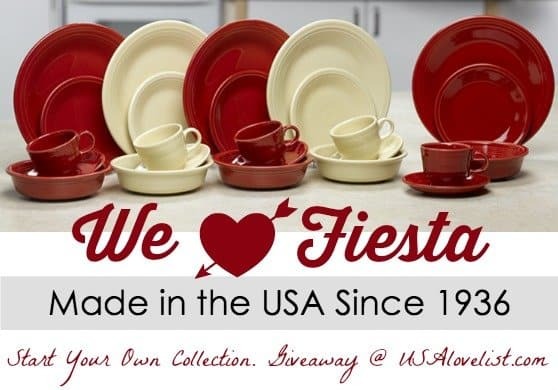 The entire Fiesta product line can be seen and purchased factory direct. 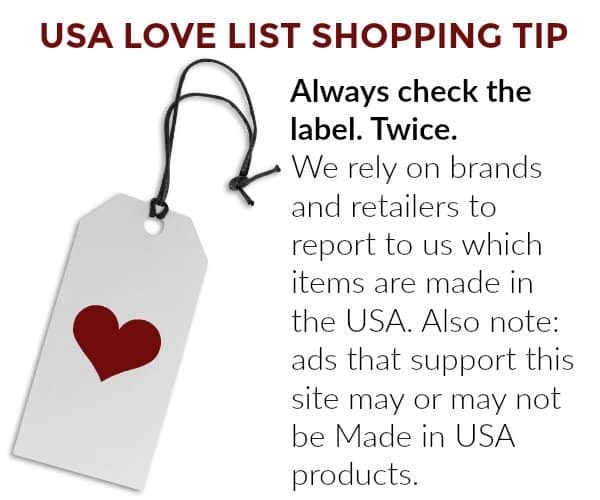 It is also available at department stores and specialty shops nationwide and online from various retailers including the USA Love List Amazon catalog. Homer Laughlin China has offered one of our readers two 3pc Bistro Place Settings in your choice of color. There are a variety of entry options including opportunities for multiple daily entries. Good luck! 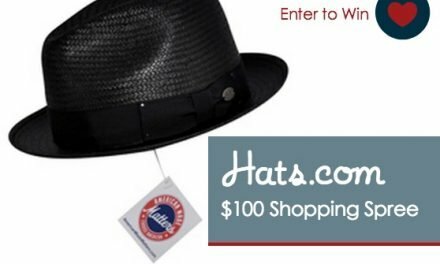 Click the arrow buttons below for further instructions on each entry. This giveaway will close at midnight on Thursday, November 16, 2017. The winner will be randomly selected, verified for correct entry participation, and notified by email. I have seen Fiestaware and have always admired it. I don’t have any, but Fiestaware is a perfect way to add some cheer and pizazz to your other dishes, especially for summer! I was just looking in my cabinet the other day, and I have hardly any dishes, not enough to have company. I don’t mind miss matches, I think they can make it look fun and happy, I’d sooooo adore having some Fiestaware the colors are so pretty I can’t pick a fav!!! ohh I love all these equally – Lemongrass, Sage, Sunflower, Tourquoise, Shamrock, they all tug at my heart! I love how sturdy Fiestaware is, too. I buy American made to support our workers and to keep the places of operation in US. My hometown used to have a giant factory, most ppl in town worked there, and then they took it away. The entire town has fallen apart. I’d like to move back to my hometown, and be a source of strengthening and caring. I think of all the people who lost their jobs, and how it impacted the town. Buy American, it shows you care. I had an aunt who had Fiestaware when I was a kid in the 60s & 70s. I always loved her dishes. They were so colorful unlike the melamine plates & bowls we had, lol. I’d love to win this! I love the bright colors of Fiestaware. It just has personality, lol. I can never have enough platters, so I really like their extra large platters. The turquoise is my favorite color. I do try to buy American-made whenever possible. It makes me feel good to know that I might be helping out an American company, & I get the reassurance of knowing the products are made to meet American standards. I’m not sure this is a Fiesta story, but I remember going to yard sales as a kid with my aunt & knowing exactly what we were really looking for: Fiestaware. Lol, that was always a great find for her! Vintage fiestaware! I’d love to win this because I love the bright colors & it reminds me of my favorite aunt. I love the colors of Fiestaware! I’ve got my eyes on some of their large platters, maybe in turquoise! Buying American is pretty important to me. I like that extra assurance that American standards of production have been met. You might not get that if it’s ‘made in China’ or elsewhere. My mother has Fiesta ware, and always has, so these dishes remind me of my childhood. 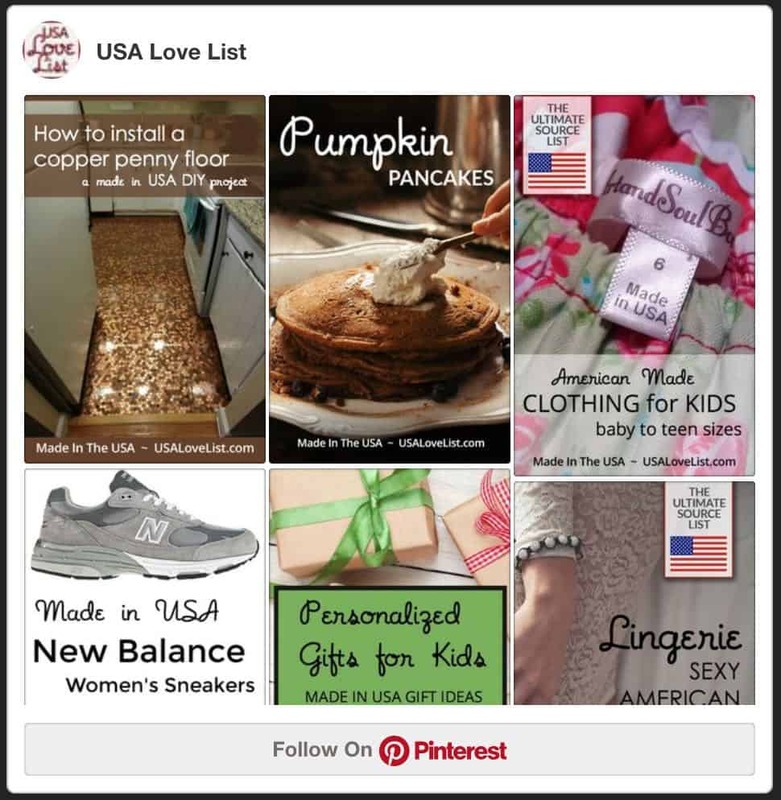 I love that they are made in the US – I didn’t know that! I would love to win these so I can start building my own collection of Fiesta ware, and so I can replace some of my poor-quality mismatched dishes. I like to buy products made in America because I know they were manufactured under reasonable labor and safety standards. I love the vibrant colors and sturdy build of Fiesta ware, and I love that they are guaranteed to be lead-free. I loved going to yard sales with my aunt looking for Fiestaware back in the 70s. It’s still considered a real find to come upon vintage stuff! I’d love to win this! The bright colors would really look great in the kitchen. I’d love to have their bowls in a variety of colors. I like the idea of using all colors to set a table. I try to buy American when I can. If I can help out a local or small business, that’s an added bonus. As a kid in the 70s, I stayed with my great aunt in Ohio for a Summer & went to yard sales with her. She loved finding old Fiestaware! I was crazy about the great colors. It was so different from what we had at home. I’d like to win this because I love the bright colors. Also, it reminds me of a favorite aunt. One thing I like that I hadn’t known about until now, is the Fiestaware Christmas dinnerware. The Merry & Bright is great, or the 12 Days of Christmas set. I would say buying American-made is pretty important to me. I like knowing certain production standards have been met & that certain standards of employee treatment have been met, too. My Grandma has a gorgeous Fiesta ware collection! I would love to start one just like hers! I would love any of the Fiesta Wear dishes from the Home Laughlin China’s website! So classic! I love fiesta ware! Its so hard to choose a favorite color, I like when they are mixed! Fiestaware reminds me of my childhood. My Aunt Margaret had wonderfully colorful Fiestaware dishes & I loved those bright colors. I’d like to win this because I love the bright colors! Fiestaware is gorgeous. I love the colorful plates & bowls. I’d like to have sets in every color & use them for a Summer party! I like to buy American-made when I can. It feels good to know you might be helping out those businesses, especially if they are local or small. Fiestaware always reminds me of my favorite great aunt. She passed away about 40 years ago, but she had the most colorful dishes! I’d like to win this because I love Fiestaware’s colors. It brightens any kitchen. 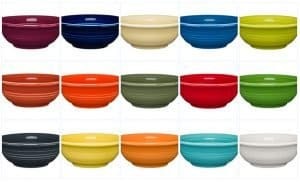 I’d love to have their bowls in every color for birthday parties! Wouldn’t that be a colorful way to serve ice cream? I buy American-made whenever I can. I like knowing the company has met standards I can be sure of. My mom loves fiesta ware, we grew up collecting pieces for her! I loved spending Summer with my great aunt in Ohio as a kid. She had beautiful Fiestaware & I loved all the bright colors. I’d like to win this because the colors are so great. I love the bright colors from Fiestaware. I really like those new ‘skull’ plates from Fiestaware. It’s neat that they offer patterns & seasonal designs, too. I would say that buying from American companies is something that makes me feel good. I like helping out small or new businesses & even helping older, established, big companies, since they do provide a lot of jobs. My aunt and grandmother each had pieces I always coveted. Fiestaware , to me, is an american classic. My current favorite color is Tangerine. I’ve loved Fiestaware since I was a kid, my mom had a few platters and the colors were just so bright and happy! I think my favorite pieces ever were the Kiwi plates that came out about 10 years ago. I only got 2 as gifts and wish I would have grabbed some for myself. I’d like to win this because it reminds me of a favorite aunt & my childhood. The colors are so great. One of my favorites is the Dancing Lady pattern. The colors in that one are really vibrant. Buying American-made is pretty important to me. Sometimes, I just can’t afford it or can’t find something, which is why I like this blog. 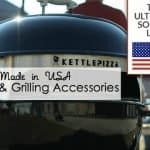 I had no idea there were so many American-made items out there, lol, & I can search for pretty much anything here & find it. Not sure this counts as a story, but I do remember going to yard sales & flea markets as a kid. Finding any vintage Fiestaware was always considered a big coup! I’d like to win this because having some Fiestaware of my own would be great. I love the bright colors. It’s really hard to pick a favorite color of Fiestaware. I like the idea of using multiple colors & setting a really colorful table! I think buying from American companies is something I consider pretty important. I especially feel good when I’m able to support new or local businesses. As a kid, I absolutely loved the colorful tables my great aunt would set with her Fiestaware. I definitely wanted to see those dishes on our table, too. I’d like to win these because they remind me of my favorite aunt. I love these dishes! Buying American-made is definitely important to me. I like knowing that what I buy has been made to meet certain standards & that employees have been fairly treated. You don’t know that if it is made in another country. I inherited FiestaWare from my grandmother. I think she bought hers in the 50s. I really like the design of them. I want to win in order to add to the Fiesta Ware that I inherited. It would be nice to have some new pieces to go with the older FiestaWare dishes that I have. It would be fun to compare the old dishes with the new ones to see if there is any differences between the old and the new in terms of quality and color. As a child I went with my aunt in Ohio to yard sales & flea markets. She was always looking for great vintage items, especially dishes. Fiestaware was always a score! I’d like to win this because the dishes are great looking. They would look great on my table, lol! I love the ‘seasonal’ Fiestaware, like the 12 Days of Christmas dishes. Those are pretty festive. I try to buy American-made whenever possible. I especially like it when I can support a new small business or a local one. Our Fiestaware story is rather a long one. I had 2 Aunts who only used fiestaware! One loved the teal color and another the green. I remember eaing off of those plates for years. My Mom had several pieces although not a set. I still have a pitcher that we used to drink milk out of. I would love to win as I adore the bright colors. I love everything they make and have a few pieces but alas no dinnerware. This might get me an excuse to get more. I have always loved the quality of fiestaware. I love how sturdy it feels. I just love it the way it is. We buy USA made to support our city and our community. I would rather look for that tag than wonder just whats in something. USA made so I buy USA made. I have several pieces of Fiesta from my Aunt. She was a huge collector, her daughter took most of course, but since I was close to her I got a covered dish I still use. 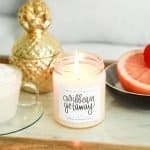 I would love to win I really admire this company and how they have kept their product to such high standards. It always looks so good no matter what the age. Homer Laughlin is a great company, their products hold up to the test of time. They dont cut corners, each and every piece can become an heirloom. We buy USA made precisely for products such as Fiestaware. It holds up, if there is a problem you know you are calling someone who cares. I would be in heaven to have these colorful dishes in my cupboards!!! I would love to replace my mismatched dishes. Thank you for this FAN tastic chance. I would love to win because having Fiesta Wear would be fabulous to have for those special occasions. The colors are so amazing that it would compliment any dish. I love how vibrant each color is. I am loving the scarlet and daffodil colors. I can see how it can brighten up a kitchen nicely. I am always drawn to USA made products. It is important to support the USA. As a small business owner, I can respect that. I am looking forward to trying Fiesta ware for the first time in the near future. They look amazing. My great aunt was a huge fan of Fiestaware. She liked tracking down vintage dishes & they were definitely different from the dishes I had seen before that. I’d like to win these because the colors are gorgeous & it would add a lot of color to my table. It’s hard to pick a favorite piece or color! I do really like the yellow bowls & plates. I love yellow in a kitchen. I do like to buy American-made. You get a little extra assurance that it will be made to meet high standards. I love the heavy feel of fiestaware-it makes my mind think they’re safe to use…in other words, not easily broken! Way back when, I had a whole collection of red, antiques dishes…I’m fond of red dinnerware, that’s the color I’d choose. I would love the whole collection, but it’s just my husband and I, so two settings is ideal. Our dinner table would be an American Celebration with every meal if it was set with this beautiful, American-Made dinner ware in Red, White and Blue. I believe this is the finest china anywhere and the colors are beautiful. I’d like to win this because I love the great colors. It brightens up the kitchen. I remember going to flea markets with my aunt back in the 70’s & helping her look for vintage Fiestaware! I love the great colors. It brings back childhood memories. I try to buy from American companies whenever possible. I like knowing I might be helping out new or local businesses, especially. I would love to win the slate color because it matches my kitchen. I would love to win because I love the look of these dishes and I need new dishes for my house! 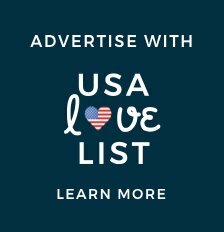 I love to buy American made because I want to increase the jobs in America! I love the bright royal blue, we tend to get blue dishes, but then again, maybe red for the upcoming holiday? I’d like to win this because it brings back childhood memories. I had a favorite aunt who collected Fiestaware. I don’t know if I have a favorite color. Several of the colors jump out at me. The yellow would definitely brighten any kitchen. Buying from American companies does matter to me. I like supporting local businesses or farmers’ markets, especially. I’d like to win this because these dishes are so colorful and pretty. They would be great to brighten the kitchen. I think my favorite piece of Fiestaware might be their baking dishes. Those are just as colorful as the other dishes, & really pretty. I try to buy American-made whenever I can. I like knowing that standards required by American laws are being met. I’d like to win this just because of the beautiful colors. These dishes remind me of bright Summer days, which would be great in Winter. I have a hard time choosing a favorite color, lol. The yellow is bright & pretty, but I love the blues, too. 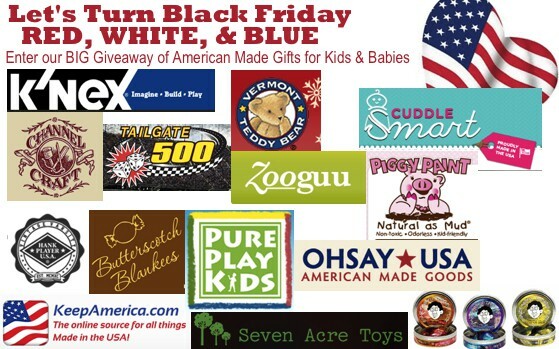 Buying from American-made businesses is fairly important to me. I try to do that whenever possible. It’s just nice to know you might be helping out those businesses. I would like the lemongrass color. Thank you for the chance to win! I’d like to win this because my kitchen needs a blast of color. Fiestaware definitely fits the bill. I really like their Christmas designs this year. The large Bistro Bowl might be my favorite, and the Christmas design on it is great. Buying from American companies is something I try to do. Admittedly, I am not a purist, though. I don’t refuse to buy from a company if some of their product is made elsewhere. Still, I like supporting small or local businesses, or new businesses, that manufacture here. All of my life I have love Fiestaware. My Texas grandmother had a bunch of it. I like to buy American made and support small entrepreneurs. I would so love to have a pair of the red place-settings just for my husband and myself. I can’t decide if I want Scarlett or Pappy though. Sorry, that color is “Poppy”. I’d like to win this because Fiestaware is just beautiful. It would look great on the table! It’s hard to pick a favorite piece of Fiestaware. I do love their Christmas dishes this year. It’s beautiful. 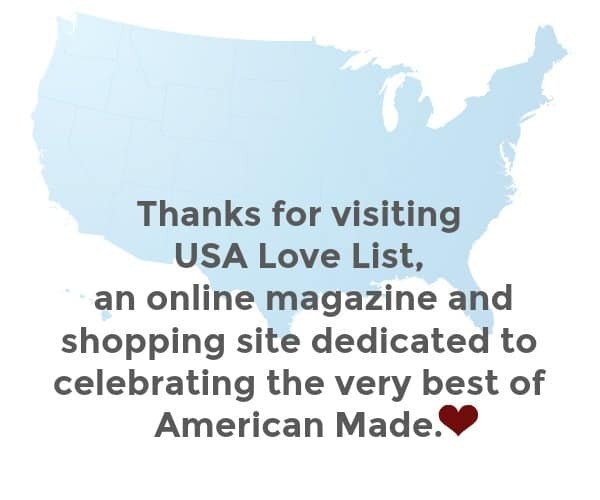 Buying from American-made companies is important to me. I like knowing they must meet certain standards with the products and in the way they treat employees. I don’t have to wonder if an item was made by badly treated children or way underpaid employees. 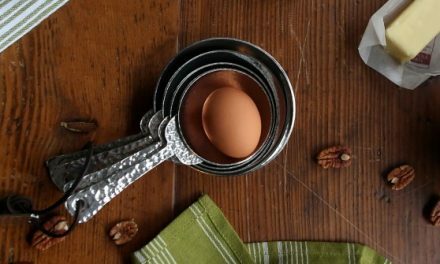 I’m excited about the bistro sets–could these be the perfect bowls? I like to be American made products because I want to support businesses that pay a fair wage and provide healthy and safe working conditions. I’m obsessed with Fiestaware and try to have several pieces in every color. The blues and greens are my favorites, with scarlet and persimmon and tangerine and sunflower for a little punch. All.the.colors. I’d like to win this because these are bright splashes of color for our dull kitchen! 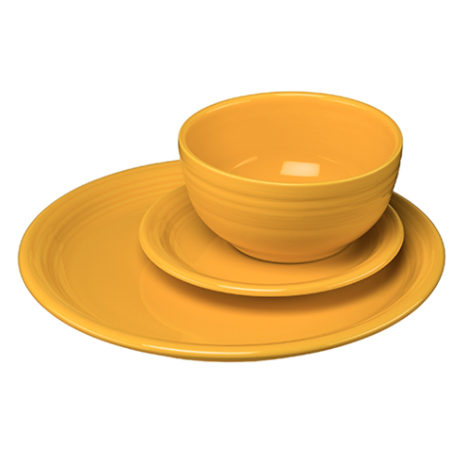 Fiestaware brings back memories of a favorite aunt of mine. I recall her scouring flea markets & yard sales looking for vintage Fiestaware. I do like buying American-made whenever possible. I like knowing I might be helping out businesses providing employment in the U.S.
Fiestaware is timeless always looks amazing in all the colors it comes in. I didnt know they made Christmas dishes too there so pretty. I have old dishes so this would be so nice to replace mine that are almost 40 years old. I always try and buy American made every chance i get . i know it helps our folks have jobs at home in the US and the items I feel are always well made too & meet American standards . It’s important to support our American economy….and I can’t very well complain about the lack of economic growth if I don’t do my part by buying American. I’d like to win this because I think Fiestaware is beautiful. I love those colors! If I won this, I think I would keep it for myself, lol. Hey, I need some beautiful color on my table! I try to buy American-made whenever possible. I do like helping out new or small companies, especially. I think the bright cheery colors make every meal something special! I really like the cobalt blue color – a bistro place setting in that color would be incredible. Most companies in the USA follow strict regulations on how to protect the environment (which I sincerely hope will continue), so buying American can help us protect the environment. I would love to win this because I have many Fiesta pieces but need a few more place settings to complete my set. And I love Fiestaware! 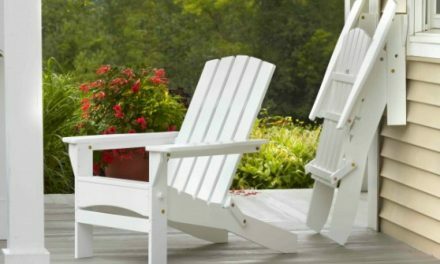 Made in USA, very solid & sturdy, & a true American classic! I’d like to win this because my kitchen could use some color. I love the bright colors of Fiestaware. Fiestaware always reminds me of one of my favorite aunts. She collected vintage Fiestaware & I remember her scouring yard sales looking for it back in the 70’s. I try to buy from American companies whenever possible. I like knowing that I’m getting products that are made according to certain standards. You don’t always get that if it’s made in China, etc. 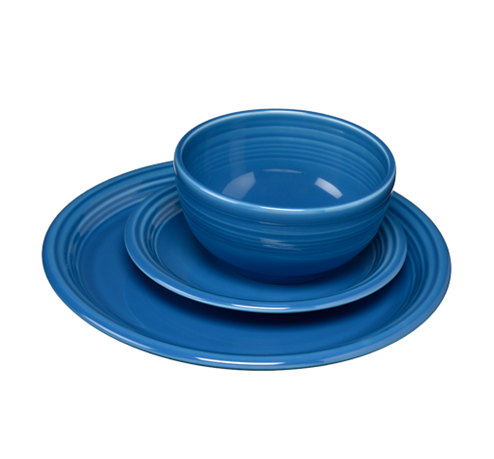 I’d like to win this because I think the colors of Fiestaware would really brighten any table. And my table needs color! Fiestaware has always been a favorite of mine. My Great-Aunt used to collect it & I loved the colors on her table! I do try to buy from American-made companies. I also try to buy from local, small businesses whenever I can. I just like knowing I might be helping them out a little. I’d like to win this because I think it’s great-looking! I love the colors of Fiestaware. If I won this, I think I would keep it for myself. Seriously, I think it would look great on any table. It would add great color & brighten the room. I think buying American-made is fairly important to me. I do like trying to help out local businesses or new companies. I would love to win so I can start a bistro set collection for my daughter. Sapphire is my favorite color. I would love to own a raspberry presentation bowl. I’m still important to support American jobs and the local economy by buying American made. I’d like to win this because I think Fiestaware is beautiful. I love the colors! They have so many great colors that I don’t know which I would choose! The yellow is bright & beautiful, but I like the blues, too. I do think buying American-made is worth the effort it might take to find it. You can support local or new businesses or buy from Farmer’s Markets if you’re looking for affordable ways to buy American. I’d like to win this because I flat out like them, lol. They would look great on any table. I think if I won this I would keep them for myself. Maybe it would be a Christmas present for myself, lol. Buying American-made is fairly important to me. I like knowing I’m getting products made according to certain legal standards. These dishes remind me of good times. They are truly so festive and fit into any decor. I would love to win the teal. My youngest daughter got married last year and everything in her kitchen is teal. She really could use these dishes. We need to keep americans working so I would love to do my part by buying american made products. I would like to win because adding some different colors to my existing tableware collection would allow me to easily mix and match and create many more options with roughly the same amount of dishes! Every time I look at the website I discover a new “favorite” color. Today it is Foundry – unique and gorgeous! 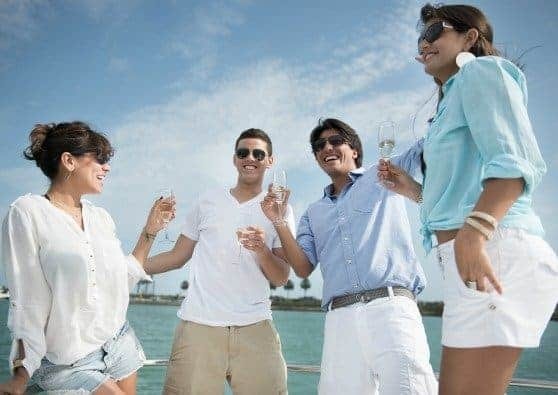 I buy American because I want American jobs to be there when my grandchildren grow up and are ready to enter the job market. I’d like to win this just because I think Fiestaware is beautiful. I want all colors, lol. It’s so hard to pick a favorite Fiestaware item, but this years Christmas dishes are great. I love the lights painted on them. Buying American-made is pretty important to me. It’s not always easy to figure out if something really is made here, but I appreciate your efforts to make it simpler! I’d love to win and add tomy growing collection of fiesta ware.